The story behind the story may seem familiar. A Pentagon employee takes a new assignment with a government agency secretly studying UFOs. He becomes fascinated with the topic and wants to do more, but frustrated by the government’s stance, he resigns. Shortly afterward he works with an entertainment company, helping them expose two previously classified UFO films to the public. That’s the story of Al Chop, who became the focus of the first factual motion picture about UFOs. Unidentified Flying Objects: The True Story of Flying Saucers was released May 1956, and its purpose was to tell the authentic story of the UFO phenomenon and its investigation by the United States Air Force. 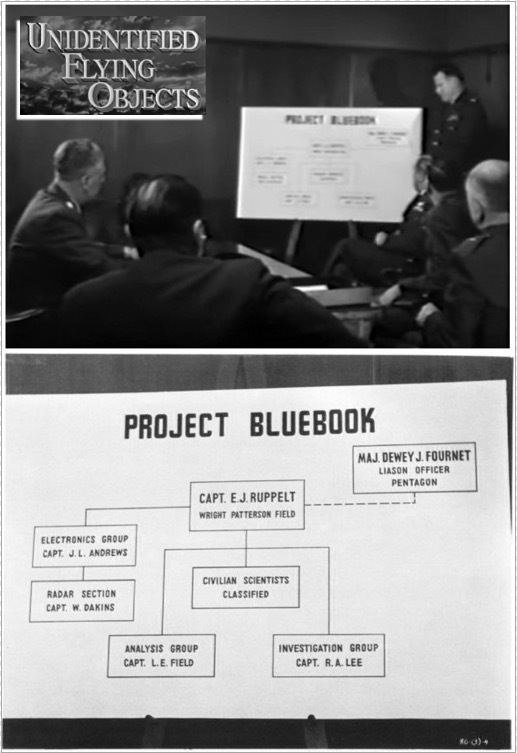 The producers enlisted the aid of authorities and witnesses, and made it with the assistance of Al Chop, the former civilian press officer for Project Blue Book, and its former head, retired Captain Ed Ruppelt. 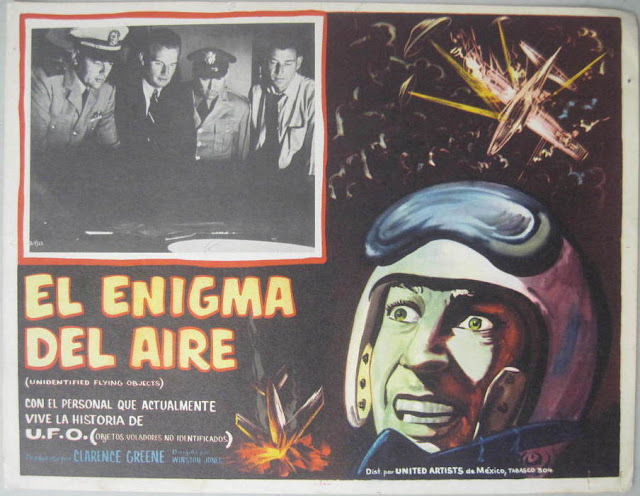 In conferences held with Lt Col Johnson of General Sanford’s office, Dr. Hynek, Prime UFO consultant, Scientific Advisor’s office and other pertinent personnel, it was agreed by all that ATIC should review this film before any wide-scale release to the public, for purposes of “countermeasures", that is, the preparation of some official comment to be kept in readiness to queries which will undoubtedly arise. 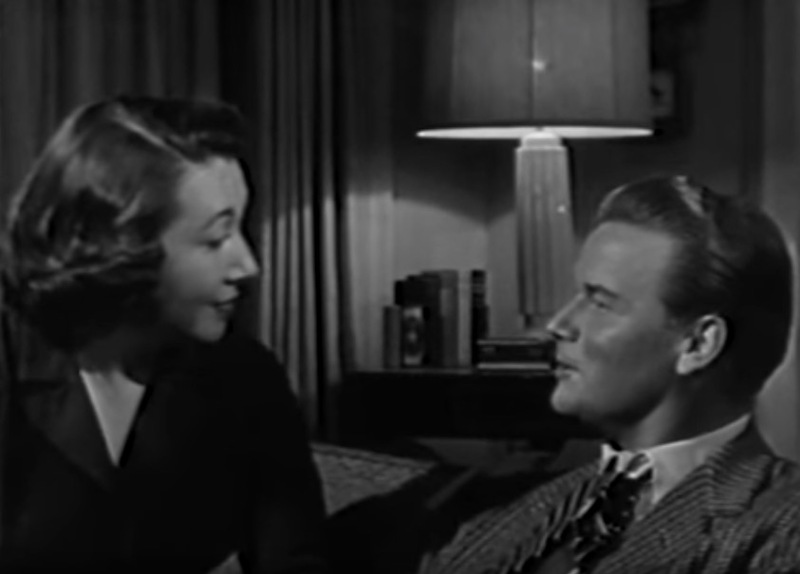 In each instance of the portrayal of a case, the film dramatically, and with great suspense, presents the incident and circumstances surrounding the sighting, then abruptly drops the matter… calculated to let the viewer form his own (influenced) conclusions. The firestorm Captain Gregory expected fizzled, partly due to the low-key approach of the film. UFO was modestly successful commercially, but it didn’t rally the public like he’d feared. The press covered it, but reviews were mixed. 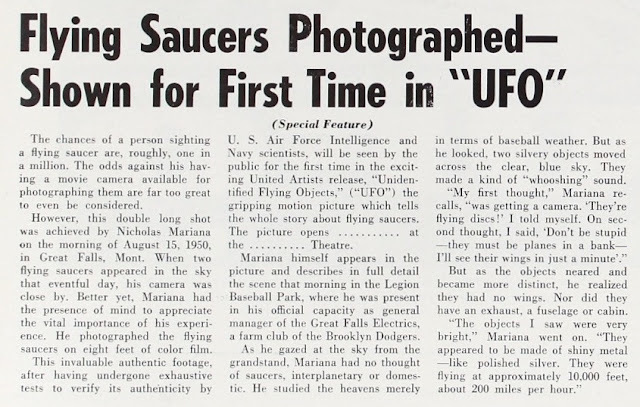 Most important things in the film are the two actual COLOR FILMS OF UFOS which were kept "top secret" for some time (UTAH AND MONTANA FILMS) and which, with the official assurance that they are not normal objects, are CONCRETE PROOF FOR THE EXISTENCE OF 'SAUCERS.' ...This film is the break saucerdom has needed; it should do the trick, with proper support by those of us who are more interested in the field. The general public and some reviewers were less impressed with the disclosure of the films. 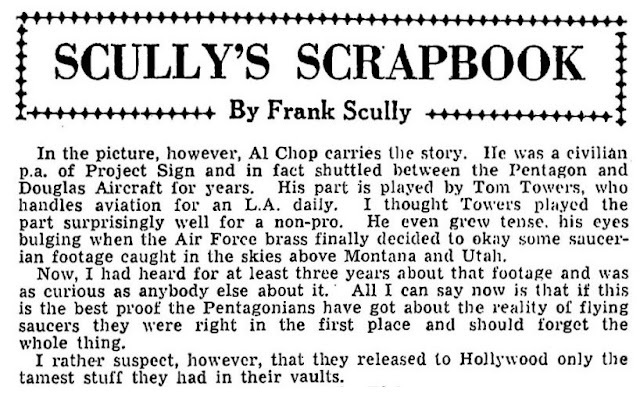 Conspiracy-minded Frank Scully, author of Behind the Flying Saucers, included a mini-review of UFO in his rambling column, “Scully’s Scrapbook,” in the June 13, 1956 issue of Variety. 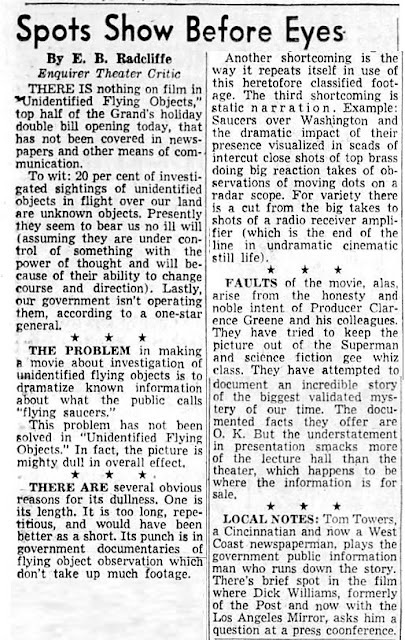 The flying saucer phenomenon was only seven years old when the film went into production, and the story takes us from Kenneth Arnold’s sighting up to the aftermath of the 1952 Washington, DC radar flap, with its “credible observers of relatively incredible things.” UFO takes an interesting approach to the history of the topic by letting us see it through the eyes of US Air Force press officer, Al Chop as he’s drawn into the flying saucer controversy. 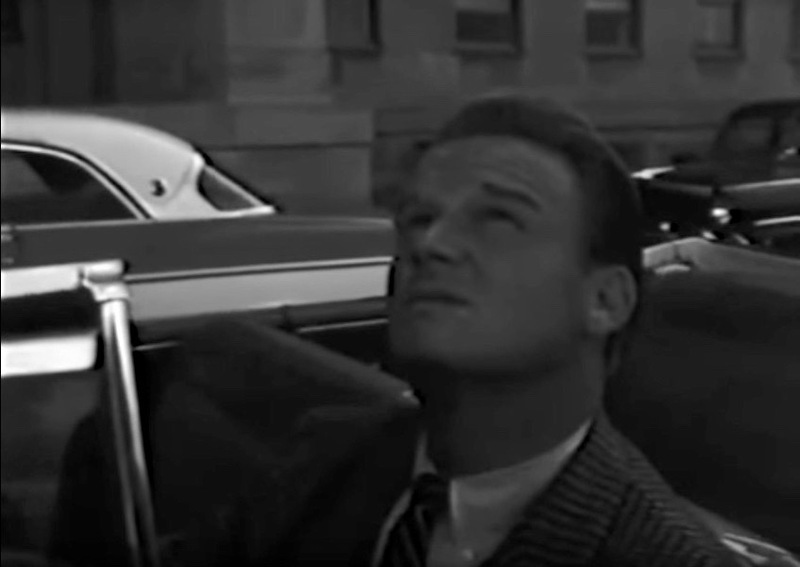 It’s a drama based on real events, with sequences featuring actual witnesses Delbert Newhouse and Nicholas Mariana recounting the stories of how they filmed UFOs. It’s not a documentary, classified as a docu-drama, dramatized re-enactments of actual events. 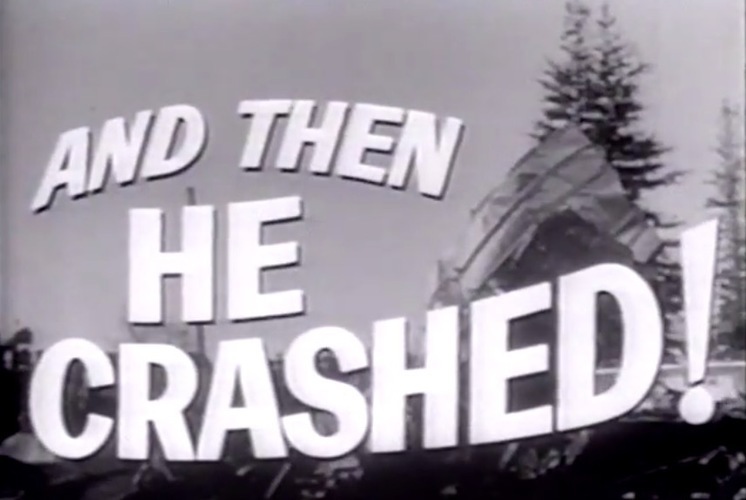 The producers, Clarence Greene and Russell Rouse tried to make the film as genuine as possible, and avoided something that would have excited viewers more, seeing flying saucers in the re-enactments of UFO sightings. The closest thing we get is the scene depicting the 1952 Washington, DC, events, and in it, all we see are blips on a radar screen, not flying saucers. 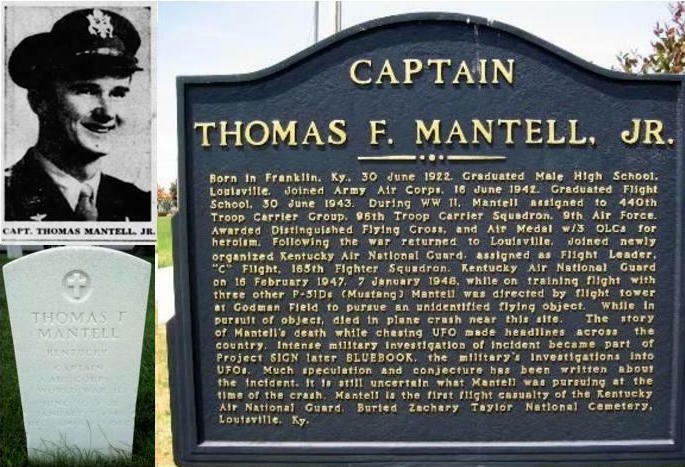 Due to this choice, a lot happens off-screen, including the UFO sighting and plane crash that became the centerpiece in the film’s advertising campaign, the fatal flight of Captain Thomas Mantell. 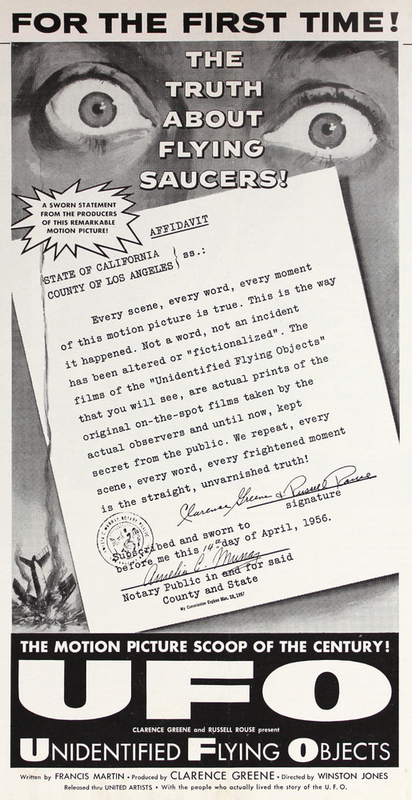 A copy of the screenplay for UFO by Francis Martin was included in the papers of retired Blue Book head, Capt. Ed Ruppelt. It was written in 1954, but included revisions, “final changes,” dated March 7, 1955. It's from that draft the passages below are taken. Ruppelt along with Al Chop and were consulted for the film to as authentic as possible. UFO Producer Clarence Greene with radar consultant Wendell Swanson and Edward J. Ruppelt. The Air Force was forced to take official cognizance of the "flying discs" because of increasing demand from the public for an explanation, and as a result of certain publications persisting in using a sensational approach, in reporting such items. We now checked with our contract astronomer at a leading university... Our astronomer reported that at the time of the observation, the planet Jupiter was fifteen degrees above the horizon and on the range and bearing of the object. There's no doubt about it. What all these people saw was Jupiter. Dr. Hynek did become involved with the film, but only in the Air Force’s defense against it, reviewing the cases presented, double-checking the debunking of them. 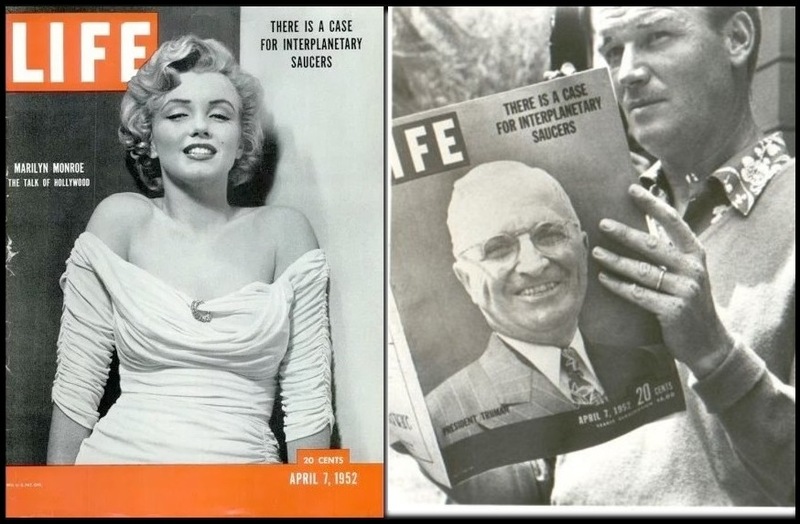 The real Life magazine, and the movie’s more dignified stand-in. We shall not attempt to sway you in your judgement. You, as separate individuals, will make your own interpretations of the Newhouse and Mariana films of the unknown objects, as well as the rest of the documented evidence presented in this motion picture. But, could we be on the threshold of a new era? Could we be entering wonderful vistas where problems and fears and prejudices fall into nothingness? Could we be entering a great era of enlightenment? What were these objects? Where do they come from? To me the evidence indicated intelligence behind their control, and by now, the belief that their source was interplanetary was no longer incredible. 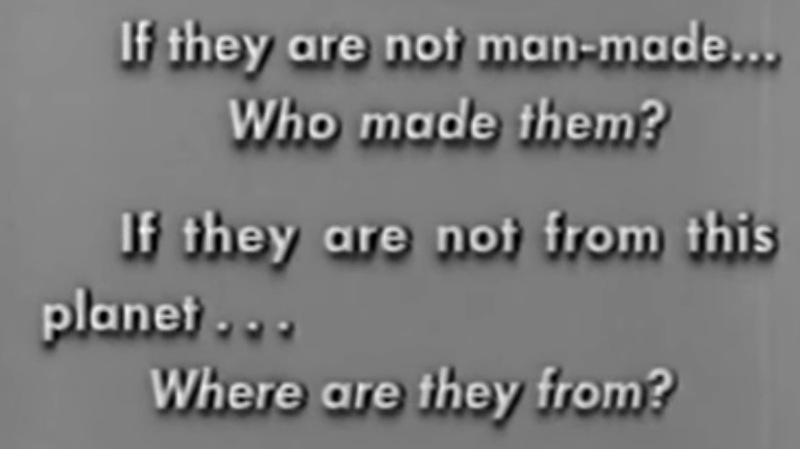 The movie did have a pro-saucer bias, and never questions that some UFOs must be structured physical craft of unknown (likely otherworldly) origin. 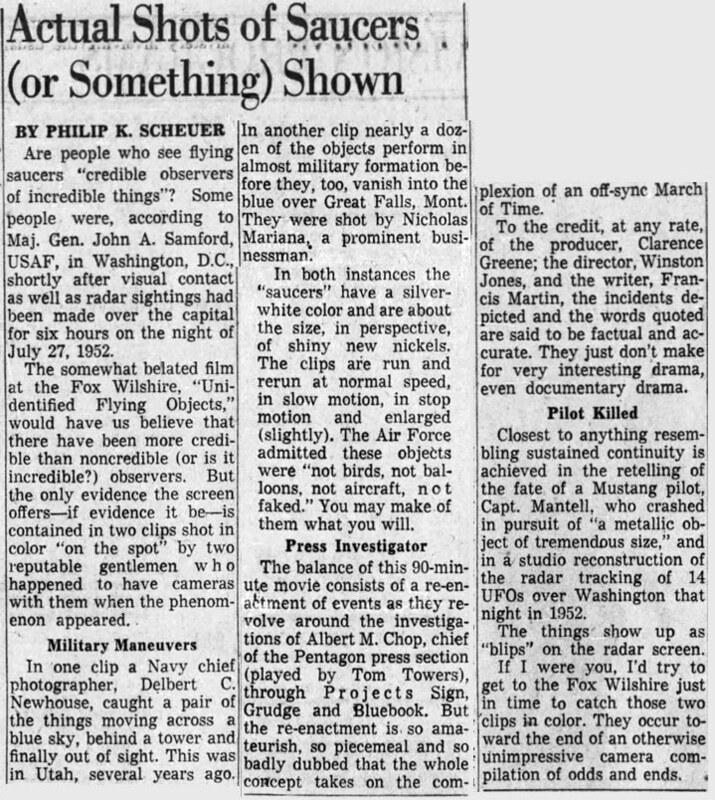 But on the whole, Clarence Greene's UFO was an honest attempt at a factual account, understated, steering clear of sensationalism and speculation. Yet, United Artists' advertising campaign for the movie was another story, and that’s perhaps what got Blue Book’s Captain Gregory so agitated. 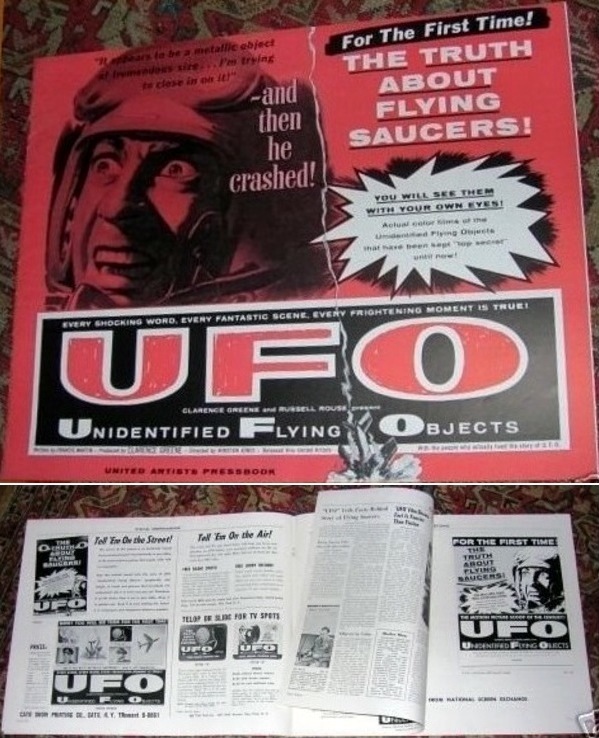 The Sensational Selling of Unidentified Flying ObjectsFrom the beginning of the industry, motion picture studios provide exhibiting cinemas with press kits with materials to help direct the market and promote of the film, from advertising campaigns to publicity stunts. Pressbooks can contain advertising slicks, suggested ad copy, and often offered additional specialized pictures, posters or three-dimensional displays theatres could buy to promote the film. Now! 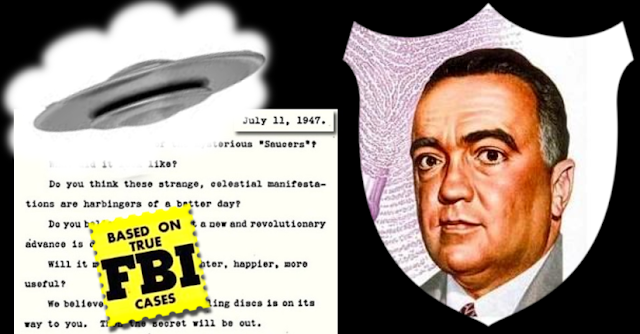 See and hear the truth about flying saucers in actual films of unidentified flying objects… kept ”top secret” until now! See it at the Bijou… the motion picture of the century… Bijou Now! 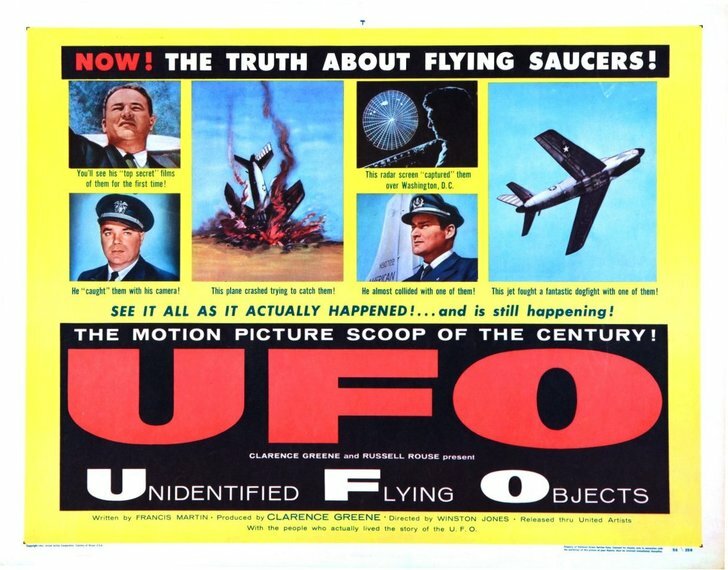 The legitimate selling point of the movie was the inclusion of formerly “top secret” films of flying saucers. The final segment of UFO showcased color footage of the Nick Mariana 1950 film from Great Falls, Montana, and the Delbert Newhouse 1952 film from Tremonton, Utah. The print advertising almost exclusively focused on capitalizing on the death of Captain Thomas J. Mantell, who had perished while pursuing a UFO on Jan. 7, 1948. Imagery on the other promotional material, from lobby cards to print advertising, also focused on the morbid angle. 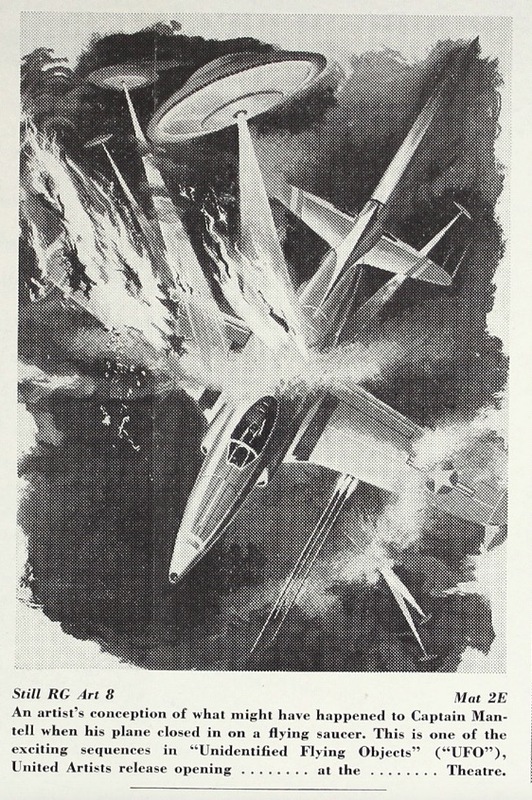 Some depicted saucers blasting the plane, while others showing the fatal crash itself. 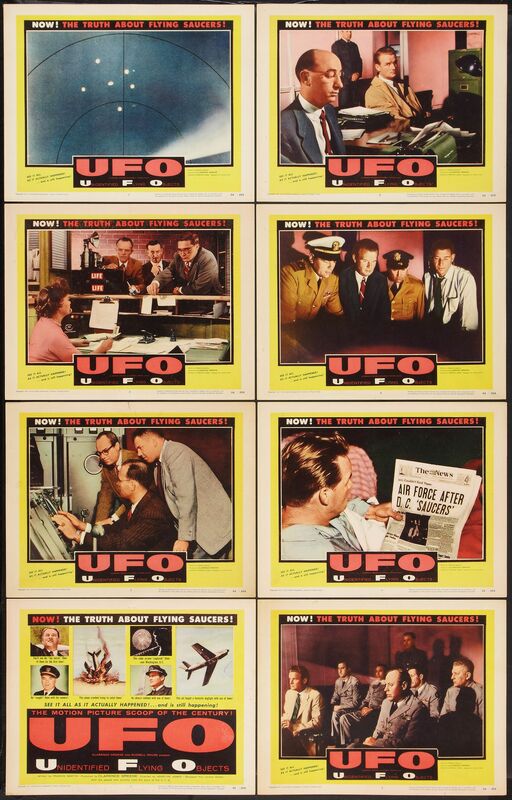 It's interesting that the hostile saucers in the promotional artwork do not appear in the film itself, but they closely resemble those featured in Earth vs. the Flying Saucers, which was released two months later. The trailer shown as a preview for the movie was likewise exploitative. 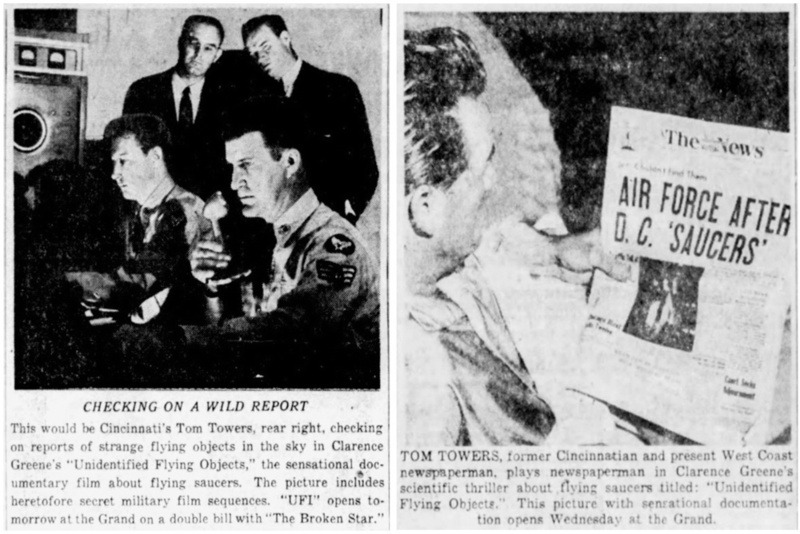 Given the message broadcast by advertising and marketing campaign, the Air Force fully expected the movie itself to be “using a sensational approach.” Instead, the UFO mystery was presented by the filmmakers in a pretty realistic manner, as something elusive, and the Air Force comes out looking pretty good in Project Blue Book’s mission to understand the enigma. On the whole,Unidentified Flying Objects isn’t a very entertaining movie, but it is an educational and informative one, important in spite of its flaws for the glimpse of history it provides. 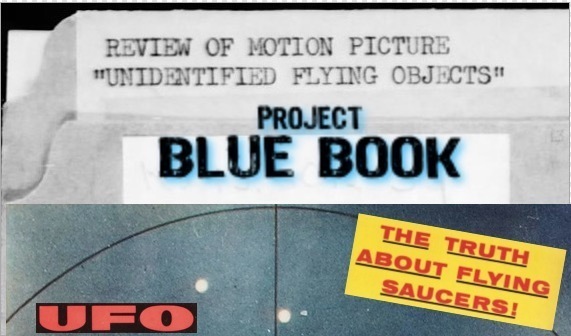 Despite the worries of the Air Force, UFO wound up giving us the most accurate portrayal of Project Blue Book ever put on screen. The film also gives the audience a taste of what it is like to investigate UFOs, relying on little more than the word of witnesses, blips on radar, and indistinct images on film. It’s fitting that the film leaves us with the protagonist pondering the evidence, but in the end, finds his belief. 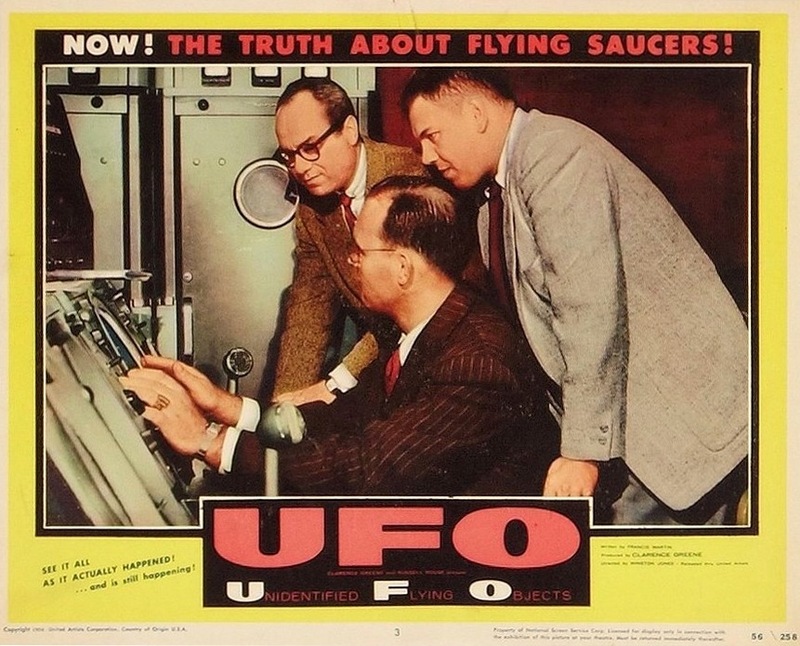 Ivan Tors is widely credited as having produced the classic 1956 film, Unidentified Flying Objects: The True Story of Flying Saucers, but that’s not wrong. Tors is best known today for his later adventure and family television shows such as Sea Hunt, Flipper and Daktari, but at the time, he was busy with his TV series, Science Fiction Theatre, which often featured UFO-realted stories. We checked with Robert Barrow who has studied the film since its release, and he stated that he had found no trace of Tors’ involvement with UFO and did not know where that mistake originated. Library of Congress’ Catalog of Copyright Entries Motion Pictures And Filmstrips, 1956. 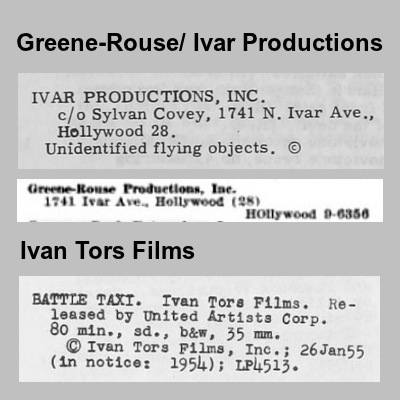 Somewhere down the line, someone confused Ivar Productions with Ivan Tors. 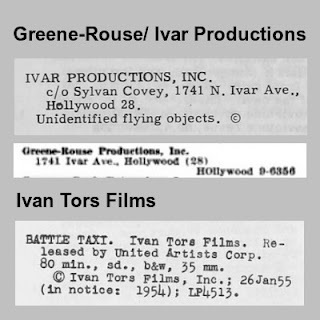 It’s true that Ivan Tors was interested in flying saucers, but he did not produce UFO, that was Greene and Rouse. 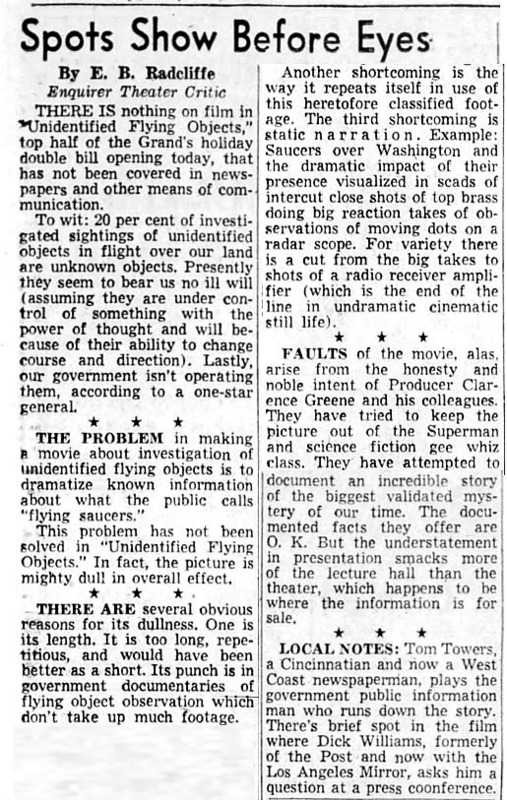 "Review of Motion Picture 'Unidentified Flying Objects'"
Only part of the movie I've ever seen was the end with the color footage, which was pretty wild to stumble across on Turner Classic Movies at six in the morning on a weekday.